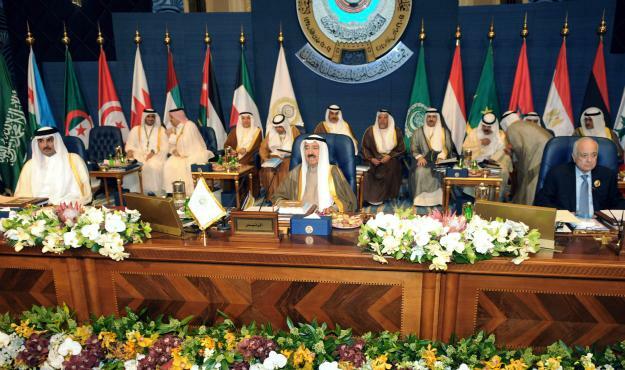 A thought constantly in my mind, and which was reinforced by the Arab League’s 25th Summit in Kuwait, is that with Arab leaders and governments as “enemies” the Zionist state of Israel does not need friends. The Arab League was formed in Cairo on 22 March 1945. Its six founding member states were Egypt, Iraq, Transjordan (renamed Jordan in 1949) Lebanon, Saudi Arabia and Syria. Today the Arab League has 22 members (though Syria’s membership has been suspended since November 2011). If the boot had been on the other foot – I mean if Zionism’s decision makers had been in the Arab position – they would have played the oil card. The first is that when Israel closed the Palestine file with its victory on the battlefield in 1948, the Arab regimes secretly shared the same hope as Zionism and the major powers – that the file would remain closed. The Palestinians were supposed to accept their lot as the sacrificial lamb on the altar of political expediency. (Thereafter, and despite some stupid rhetoric to the contrary which gave apparent substance to Zionism’s propaganda lies, the Arab regimes never, ever, had any intention of fighting Israel to liberate Palestine. It was only in Zionist mythology and brainwashed Jewish minds everywhere that the Arab states were committed to driving Israel’s Jews into the sea). On 5 March, Saudi Arabia, the United Arab Emirates and Bahrain withdrew their ambassadors from Doha because of Qatar’s support for the Muslim Brotherhood and Al-Jazeera’s coverage of events in Egypt. Prince Saud al-Faisal, Saudi Arabia’s ailing foreign minister, apparently said that severance of ties with the Muslim Brotherhood, the closure of Al-Jazeera (in Egypt only?) and the expulsion of two U.S. think tanks – the Brookings Doha Center and the Rand Qatar Policy Institute – would be enough to prevent Qatar from “being punished”. Saudi Arabia is gambling on supporting former General Abdul Fattah el-Sisi in Egypt (where the next Arab League Summit is to be held) to help keep change away from its own doorstep. Only the future will tell us if Saudi Arabia backed the wrong horse, too. As I write I find myself wondering if future historians – I mean honest historians – will conclude that George Habash was right and Arafat was wrong. About what? Habash was the founder and leader of the Popular Front for the Liberation of Palestine (PFLP) until ill health forced him to resign in 2000. Until the Arab defeat and humiliation of June 1967, he was a supporter of Egypt’s President Nasser and looked to him to lead the struggle to liberate Palestine, all of it. After the Six Days War Habash changed his mind. He said to Arafat (in a coffee shop in Damascus) that the key to liberating Palestine was the overthrow of the corrupt and impotent regimes of the then existing Arab Order and that PLO should lead the revolution to make it happen. Habash argued that it could happen because the Palestinian cause was alive and well in the hearts and minds of the Arab masses everywhere and more and more Arabs were becoming aware that their regimes had betrayed the cause. For the record… The Israeli and American version of history which asserts that Arafat sought to overthrow King Hussein and take over Jordan in Black September 1970 is nonsense. As I documented in detail in my book Arafat -Terrorist or Peacemaker?, Arafat was working WITH Hussein to try to prevent Habash’s PFLP and other Palestinian fringe groups provoking a confrontation with the Jordanian army. This was confirmed to me by King Hussein himself. Israel and America would not have been able to misrepresent what happened if Arafat had used Fatah’s superior forces to disarm the PFLP and crush it if necessary. I asked him why he did not do so. He said that if he had triggered a Palestinian civil war, Israeli and other agents would have used it as a cover to assassinate many Fatah and other Palestinian leaders. That made sense to me. The whole story about what really happened and why in Jordan in September 1970 (I was there for the BBC’s Panorama programme) includes the fact that King Hussein did not want to move against the PLO. So why did he? Arab League like the United Nations, is a showcase of western imperialism. I never expected anything good coming out of the 25th charade - which consumed most of its time arguing over Syrian president Bashar al-Assad and Egyptian Muslim Brotherhood. However, two thing really surprised me. The 21-member body saluted the Lebanese Islamic Resistance Hizbullah in foiling Israeli aggressions in Lebanon and Syria. It also, on a second thought, canceled its invitation to the US-funded Syrian National Coalition (SNC) to represent Syria at the summit. Trust me, in the Arab world, since very very long, Arab League means nothing to Arab. No body knows when/where/what/why it exist or doing, except "some" of the people forced to take alternative roads (far from the meeting) in the country where it is held, to discover later that there was a Arab League meeting!!! Israel draws its strength from the weakness of his opponent in particular of their corruption. The only opponents that this rogue state respects are Hamas in Gaza and Hezbollah because these two organizations are inscrutable.